This past summer I was invited to join a team of teachers by presenting my ideas on Music and Literacy and Studio Days at the Connectivity Virtual Conference hosted by Susan Riley of educationcloset.com. While there, the hostess and arts integration specialist spoke about her new book Shake the Sketch. I was very excited to get my copy and soon after dove into this great resource! If you are at all interested in making change in your school or district, this is a must-have book! Susan is a wealth of knowledge when it comes to creating a pathway for arts integration for teachers. 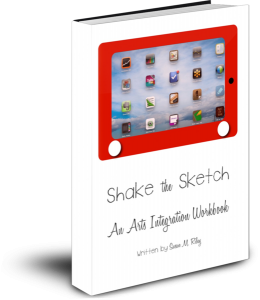 Taking the viewpoint that it IS possible to shake the sketch and wipe the slate clean, Susan describes in detail how to build a great arts integration program for your classroom, school or district. The workbook is easy to read and follow with sequenced chapters in what arts integration is, how to create a vision with a team, curriculum mapping, lesson planning, assessment and how to achieve great professional development. Each chapter contains clear explanations, examples of success and ends with additional resources. There is even an optional assignment for each chapter that allows you to look more deeply into the concepts and ideas presented so that you come away with concrete, usable resources of your own that can act as materials for teaching or advocacy. I, myself, have started to implement the ideas found in this book with the PLC I have organized in the Amesbury, Massachusetts district where I work. After years of building a community of like-minded teachers, I feel like we were lacking solid direction as a Pre-K through grade 12 group of teachers. This book has given me the direction I have needed to lead this core group to making change in our district. These teachers are excited to create a vision and follow through with the work that lies ahead. These teacehrs are also excited to get their own hands on this great book and for the very affordable price, there’s nothing stopping them. You can order the book in print for $21.99 or purchase the ebook version of it for only $8.99! You cannot go wrong here! But before you scurry over to Amazon, you may want to enter yourself in this giveaway first. Susan has been kind enough to offer a book for us to giveaway to one of our readers here at The Inspired Classroom. To enter, all you need to do is comment on this post and tell us how you would use this great resource. Everyone who comments will be entered into a random drawing and the winner will be announced on Friday. So, wait no more! Comment away!